As the 1916 centenary commemorations continue, two things become increasingly evident. First, that the Dublin-centric version of Ireland's Easter Rising on which many of us were raised has obscured a far wider national story. Secondly, how many personal stories have yet to come to light. My book A Woven Silence: Memory, History & Remembrance was inspired by a sense that I ought to know more about my grandmother’s cousin, Marion Stokes, one of three Cumann na mBan women who raised the tricolour over Enniscorthy’s Athenaeum in Easter Week 1916. County Wexford rose late, confused at first, like the rest of the country, by MacNeill’s order countermanding the rising, then responding to subsequent orders from the GPO to destroy the eastern railway approaches to Dublin. The Athenaeum garrison was the last to surrender, holding out stubbornly until its commanders were brought under a white flag to Kilmainham to receive personal orders from Pearse as Commander In Chief. In writing the book – and as a result of responses to it I’ve received through social media – I’ve learned much about Marion and her comrades. I've also learned a great deal about how little most Irish men and women were taught about what happened outside the capital before, during and after Easter Week. The reasons for that ignorance are complex and, I believe, should be explored and understood as part of the centenary commemorations. It’s heartening, therefore, to see how many stories are emerging across the country. On Easter Monday morning I was in Dublin, speaking about lost memories of the women of 1916 as part of RTÉ’s Reflecting The Rising. That afternoon I was in Enniscorthy where the Athenaeum has been beautifully restored for the centenary. 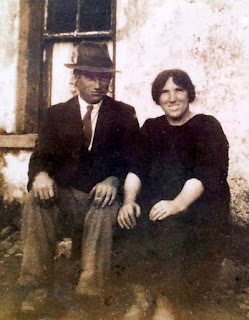 This week I’m back in Corca Dhuibhne, in a stone house that was once home to a couple called Paddy Martin (An Máirtíneach) and Neillí Mhuiris Ní Conchubhair. Neillí Mhuiris Ní Conchubhair and her brother James. I’ve lived here for fifteen years but it’s only now in the year of the centenary that I’ve found Neillí was a member of Cumann na mBan and that, on April 22nd 1916, Paddy, a fisherman, took part in a night march across the Conor Pass with over a hundred other armed Volunteers from the Gaeltacht and Dingle town. The weather was bad and the road worse and many of them reached Tralee barefoot. Their mission, though at the time they were unaware of it, was to liaise with Casement after the landing of the Aud, the ship on which he was bringing arms from Germany. In the 1960s personal statements were collected from surviving Gaeltacht participants in the march, all of whom had assumed they were marching to battle. They tell an extraordinary story of courage and physical resilience. Among them is one from Paddy who remarks, almost in passing, that he and a companion undertook the forty mile trek to Tralee after a sleepless night out fishing off Ard na Caithne. When one of the men who set out to cross the Conor Pass was warned that he might not return he replied philosophically: ‘más é ár lá é, ‘sé ár lá é’- ‘if it’s our day, it’s our day’. But in the event, Casement was captured, the Aud with its cargo of arms was scuttled and Robert Monteith, who had accompanied Casement from Germany, brought the news to Tralee where the men of West Kerry were waiting. It was the discovery of the loss of the Aud that precipitated MacNeill's order to postpone the rising. And as Pearse and others frantically made plans to go ahead anyway, those who had gone on An tSiúlóid Mhór (The Big Walk) returned from Tralee to Dingle on a train commandeered by their captain. It’s easy to forget that throughout Ireland similar Volunteer and Cumann na mBan companies were ready and prepared to rise during Easter Week, and that the fact that they didn’t doesn’t change the fact that they’re part of the 1916 story. 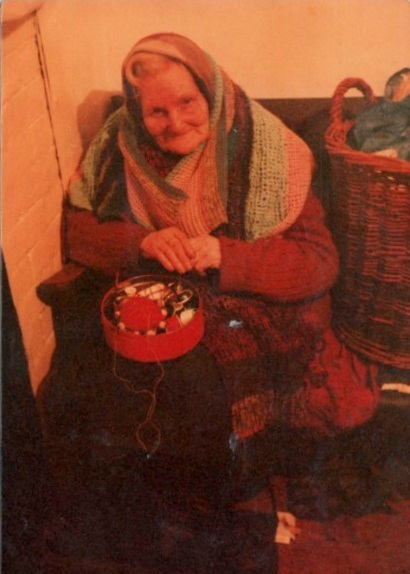 As with the story of Marion Stokes and her companions in Enniscorthy, An tSiúlóid Mhór has never had a place in the wider national consciousness. But today members of the families of the men who made that march are re-enacting it on foot, starting from An Buailtín, Baile ‘n Fheirtéaraigh. When they gathered this morning they were joined by girls from the local school and others, and the beginning of the long march over the mountain was accompanied by pipers and other musicians. A hundred years ago the local Volunteers gathered on a nearby beach and made their way to join their comrades in Dingle in secret. Among those who attended the preparations for the re-enactment wearing their families' 1916 medals was the nephew of Mary Sheehy (Mold) of Baile Eaglaise who, like her neighbour Neillí here in Corca Dhuibhne and Marion in Enniscorthy, was only in her teens when she joined Cumann na mBan. During the War of Independence that followed the Rising, Mary Sheehy and other Cumann na mBan members all over Ireland acted as a network of support for their male companions in arms. Gearóid Mac an tSíthigh, Mary's nephew, said he was there to make sure she was remembered. As I'm typing this the marchers are on their way to Dingle. Tonight they'll cross The Conor Pass. And in a Gaeltacht area where the oral tradition still flourishes the story of An tSiúlóid Mhór will be remembered and passed on as integral to the story of the Rising. It was wonderful to read of this reenacted 40 mile march. It brought tears to my eyes, for men now, and men then who rose up and supported Ireland in the only way they could. Ireland will always survive with citizens like these.